True luxury is not measured by the cost or by carat, but by the unforgettable experiences that stay with you forever. This is cruising as it was meant to be. throughout the ship and all fine dining and beverages - without exception, without compromise. to catch up with my book. yourself a lot of money. 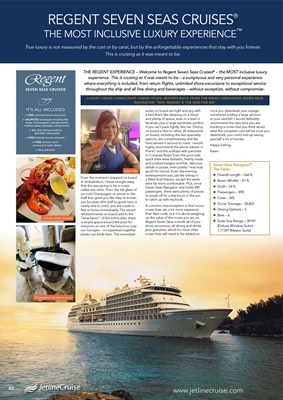 NAVIGATOR: "WHY REGENT IS THE ONE FOR ME"
❖ Overall Length - 566 ft.
❖ Beam (Width) - 81 ft.
❖ Draft - 24 ft.
A whole Lobster to myself!